We recently talked about Wooden vs Plastic Playhouses. In that article we discussed some of the pros and cons of each type of construction and things to consider before buying a hideout for your kids to play in. This article focusses on plastic playhouses, the primary manufacturers and the wide range of designs being offered. The two biggest players in this market are Step2 and Little Tikes. From everything we’ve read, both companies offer similar quality products and provide excellent customer support. Families mention quick response times on missing or defective parts as well as dog-eaten phones being replaced free of charge. Their plastic playhouses, like most of their toys are designed for pre-school aged children. They both boast of being “Made in the USA” but may also incorporate foreign parts. It appears all current Step2 models are identified as “Made in U.S.A. of U.S. and Imported Parts”. Little Tikes has 4 playhouses in their current offerings being sold as “Made in the U.S.A” and a number of others labeled “Made in U.S.A. of U.S. and Imported Parts”. Both companies sell replacement parts on their websites but many families report the companies have provided them free of charge. Your experience may vary but from the numerous reviews we looked at on a number of websites, it seems they are both quite responsive to customer inquiries. ECR4KIDS is another manufacturer of children’s plastic playhouses. Their focus is on classroom furniture and equipment but they offer several options, including a pirate ship. A number of their products are GreenGuard Gold Certified. They do not discuss the country of origin for their toys on their website or product descriptions. They seem well-regarded among educators but there simply was not as much online discussion of their products as there were for Step2 and Little Tikes. 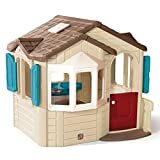 Amazon also offers one plastic playhouse made by American Plastic Toy – it’s offered in a blue model for everyone and a pink and purple one for girls. Their website is a bit limited and they mention “Made in the USA” but do not clarify if some foreign parts might be used. Step2, Little Tikes and ECR4KIDS all offer their assembly instructions online. Might be a good idea to take a look prior to selecting a plastic playhouse for your children. There is a nice variety of options for plastic playhouses. They have ones that look like little clubhouses, miniature houses and even a pirate ship. There’s a huge variety to choose from but we thought we would share with those we feel best represent each of the manufacturers. One of our favorite Little Tikes plastic playhouses is the Home and Garden Playhouse. It’s like several toys in one and is made in the USA. The house comes with a play kitchen that includes a stove with clicker knobs and sink with a faucet. On the other side of the structure is a nail pounding bench (kid-sized plastic tools and nails are included), sand and water play station and a planting area. Children can also plant and grow flowers in the flower box that hangs from the door of the playhouse. Unlike most of the other playhouses, the fence, mailbox and flower box are designed for the children to assemble and disassemble - providing another great option for imaginative play. The assembled size is 80.31''L x 36.84''W x 52.75''H (width includes the fence). Our favorite Step2 playhouse is the Welcome Home Playhouse. This one is also several toys in one. It is made in the USA but the telephone and doorbell are identified as being from China. Kids will love the realistic-sounding doorbell; it requires 4 AAA batteries, which are not included. As you can see, this plastic playhouse is designed to look like a small house; it even has two bay windows and a skylight. It has a kitchen with a sink, range, fold out table and a storage cabinet. It even has a welcome mat that encourages everyone to wipe their feet before entering the playhouse. The assembled size is 66.00 H x 73.00 W x 66.00 D. This model is quite roomy on the inside. One family had two kids, two adults and two dogs comfortably in their’s at the same time. A number of vendors offer this item on Amazon, prices vary greatly but you can get this item shipped directly to your door mat. While not a classic playhouse design, we really like the ECR4Kids Plastic Buccaneer Boat with Pirate Flag. It is a bit smaller than the Little Tikes and Step2 plastic playhouses. It provides the opportunity for your little ones to set sail to faraway adventures on the high seas or for you to move it around the house. The boat measures 54.30” x 30.70” x 56.70” (height is reported to include flag) when assembled - wide enough to be stable, narrow enough to fit through doorways. 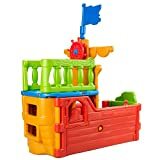 This sturdy and colorful toy has plenty of room for a ship’s captain and several passengers to embark on a journey full of discovery. This appears to be the easiest of all of the playhouses we have seen to assemble - no tools are required except to install the included tie-down bolts. My First Playhouse by American Plastic Toy is the least expensive of the four plastic playhouses we are sharing with you. It is generally sold for under $100. It is available in the blue, as shown, and a pink and purple version. There is a working doorbell (batteries not included) and a mailbox. Unlike the Little Tikes and Step2, this playhouse does not come with extra activities and accessories. Before considering this budget-friendly playhouse, understand that you have to separate the pieces from the plastic forms and trim off any sharp bits left behind. Some families found this extra step daunting, others were happy to find a cute plastic playhouse for a great price. It is also smaller than the other options (43 1/4” x 30 1/4” x 43 1/2”) but it can be easily moved from room to room. Plastic playhouses offer families a number of benefits not found in wooden playhouses. They can be easily cleaned with a garden hose. They can be easily moved from one room to another or one house to another. When your children outgrow their toy, it can be passed along to friends and family for their little ones to enjoy. And, they often come with a smaller price tag. However, plastic playhouses are generally designed for toddlers and your children may outgrow their toy fairly quickly. ← Kites for kids, let’s fly a kite!